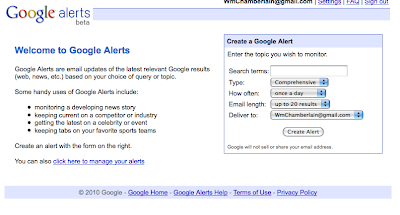 Google Alerts is a great way to keep track of what is going on online. If you have a Gmail account you can set up an alert for a specific term and Google will email you when that term is posted on the internet. You can set it up to email you immediately or less often. You can manage your alerts and change their settings or even delete them. This is what the alert email looks like. It puts the key term in bold so you can see how it is used in context. Why would you want to set up an alert? If you are like me, you want to know when you are being discussed on the internet. Another great way to use it is to see if someone is talking about your blog, wiki, podcast or other content you have created and posted online. 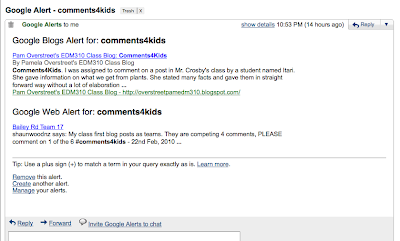 I love to use it to see who is posting about a pet project of mine: #comments4kids. The students have the opportunity to choose any digital tool to help them. One of my students, Jacob, chose to use a wiki to record what he is doing. 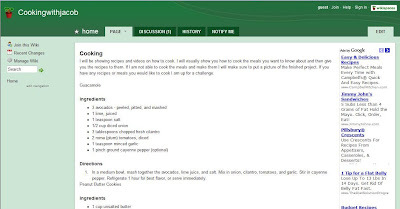 The wiki, titled Cooking With Jacob, reflects Jacob's new interest in food (a subject I hold near and dear to my stomach!) He has started to record recipies he is collecting. Isn't this what we are looking for as educators? Not only do we see the integration of technology into the speech class, but more importantly we see learning being connected through two different classrooms. When I changed jobs my biggest goal was for my class was to allow students to use digital tools to reflect what they are learning in their content areas. Yesterday a student took the first step. Kidblog.org may be just what the teacher ordered, especially for students under 13 years of age. I have spent many years looking for a way for my under 13 students to create content on the internet with limited success. Most sites require a person be 13 years or older before they can create an account. If they create an account under 13 they break the TOS (terms of service) which means their account could be suspended or deleted. Kidblog allows teachers to create class blogs for their students under 13 in a very easy way. 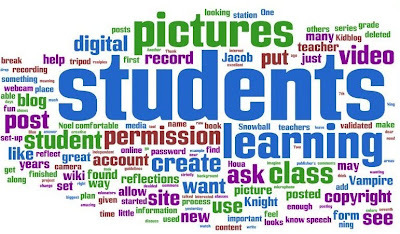 After a teacher signs up for an account and create their blog, they can simply add the students name and password. When the student goes to the blog site, there is a drop down menu for their name and they only have to enter their password. Another great feature of the site is that both comments and posts can be moderated. For those of you that have students that are beginning their online experience and may be inclined to share too much information or those who might want to start flaming others this is a must. The major drawback to the site is that it has no customization options. You can't add the great widgets, slideshows, or plug-ins you may be used to. You can't even change the template or colors. Despite the drawbacks, I think Kidblog is a great way to introduce new teachers and new students into blogging. While it does lack some functionality, it will definitely hit the spot for many students and teachers. A few days ago pictures started to appear in my moderation que on my 7th grade class Ning. Two of my students had found a site that had pictures they liked from the Manga series Vampire Knight. Not wanting to break copyright law I deleted the pictures and talked to my classes about copyright, creative commons, and how to ask for permission to use copyrighted images. One of the students that had posted the pictures wanted to ask for permission to post the pictures so I had her bring in a copy of her book to get the publisher's information. The book was published by Viz Media LLC. I went to their website and found an online form to fill out. I had Hou type on the form and ask for permission to post the pictures. I like the Vampire Knight to put on my blog.....but my teacher wants me to ask permission if i could put it on my blog. My student was posting pictures found on websites from the Vampire Knight series. I would not allow them to be posted because we don't have the right to publish these pictures. We decided to contact you and ask for permission. It isn't enough to discuss copyright with our students, we need to help them find solutions to copyright issues. While I don't know if we will be given permission to post these pictures I do know that Houa has learned how to ask instead of just take. The process is more important than the outcome. I have been meaning to do this all year, but things don't always happen on my time table. Today I finally finished setting up my Digital Video Reflection area. My plan has been to have a place where students can jump in and make a quick video where they talk about their learning and then post it to their blog or the class ning. I believe that reflections is the most important step in the learning process and I want to be able to facilitate it in my school. Why did I set this up when students are perfectly capable of writing their reflections? The answer is simple, because it is awesome! Let's face it, we live in media rich culture. Why read when we can see a picture; why see a picture when we can watch a video? Why put up the students reflections where they can be seen by others? The same reason I write these posts, because I want people to see them, reflect on them, and hopefully leave a comment. My students want their learning validated just like I want to have my learning validated. Here is my set-up. I use a Logitech webcam mounted on a tripod (with masking tape) to get enough elevation for the picture. The webcam is hooked up to my laptop along with my Blue Snowball microphone. Although the sound is not as loud with the Snowball, the students don't have to wear the headphone/microphone combo. I set up a barrier so that the student recording wouldn't feel watched as they create their videos. It is hard for many to put themselves "out there" with their recordings and this can help them feel more comfortable. This shot is from the back. I put the screen behind the student so it looks a little nicer than the wall/window combination. I plan on getting a few more screens to place around to cut down on the background noise and to make the student more comfortable. It looks raw, but if you have ever been to a television station before, only what shows on the camera matters. Here is Yessy doing the first video reflection on the new set-up. She does an amazing job with her explanation. After she was finished I had her post the video on the seventh grade class ning. It will be used as an excellent example for the other students to emulate. I would love to be able to set up a station like this in each classroom so that students would have access to them all the time. Imagine students having a Youtube channel that is devoted to what they are learning! Get Rid of Grammar in Elementary School! Yes, I expect to get flamed with this post. Ten years ago I suggested to a room full of educators in my district we should stop teaching cursive writing and was almost burned at the stake for my heresy. There were over 40 teachers in this meeting and the vote was me for everyone else against. Now it is time to discuss another subject that I think needs to be done away with (at least on the elementary school level.) Grammar should not be taught as a class in our schools! We teach the same thing in 3rd grade as we do in 8th and they still don't learn it! If we spend 25 minutes a day on parts of speech every day for 170 days a year that equals 71 hours. If we do that for six years it equals 425 hours, but how many of your 8th graders can successfully pick a noun out of a sentence? Why do we continue to teach them something they won't or can't learn? I am not advocating allowing students to use poor grammar or conventions while writing, after all writing as a form of communication needs to have rules or the communication suffers. Obviously we cannot let this occur. What I do say is that there is no real need to learn about nouns, verbs, or adjectives unless (and maybe not even then) they fall into two types of jobs; teaching grammar or being in a writing profession. After all, can't we require our students to make better word choices without identifying them as a specific part of speech? Let's throw the systematic teaching of grammar out of our grade schools, it isn't needed!